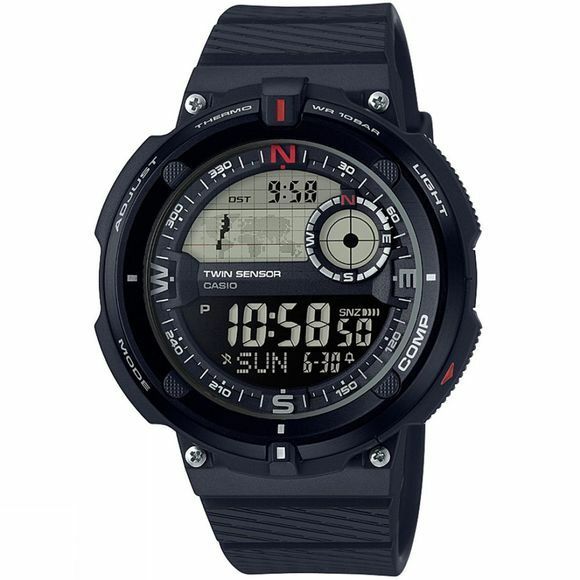 The Sports Watch SGW-600H-1BER from Casio has twin sensors so you can measure the temperature as well as finding magnetic north, which could come in handy if you are ever unsure where you are, or as its better known... lost. You'll never be late as the seamless World Time Function keeps you in synch with global time, and a dual time and world map displays make it even easier. Five independent daily alarms give flexible reminders of important timings, while a handy snooze button if you wish to be reminded again in a few minutes. If you are exercising you can use the stopwatch function to ensure you meet your target times, with the brilliant countdown timer allowing you to see timed efforts on the move. The watch can also be personalised with twelve or twenty-four hour settings and button tones on or off. You can wear it in the water too as the 10 Bar (100m) water resistance will keep the watch safe. At just 46g the SGW-600H-1BER sports watch is a great lightweight all-rounder that keeps the time accurately, but has plenty of no nonsense features.